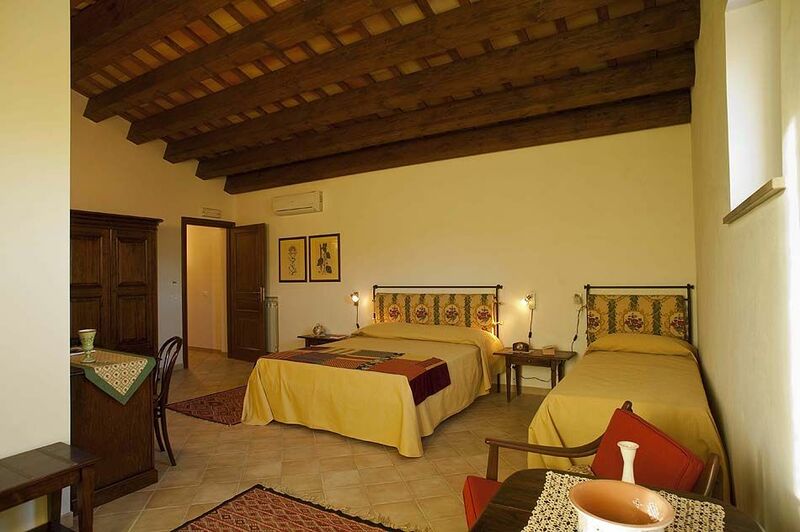 Ideally situated within walking distance of the village of Buseto Palizzolo (1 Km) and 20 Km from Trapani. Villa Buseto is located in a sunny, quiet but not secluded location with beautiful views of the surrounding countryside. The bright, spacious interiors are comfortably and tastefully furnished with a combination of antique and contemporary pieces. All 8 bedrooms are en-suite and have air-con. There is a restaurant only 200 metres away and a shop 400 metres. 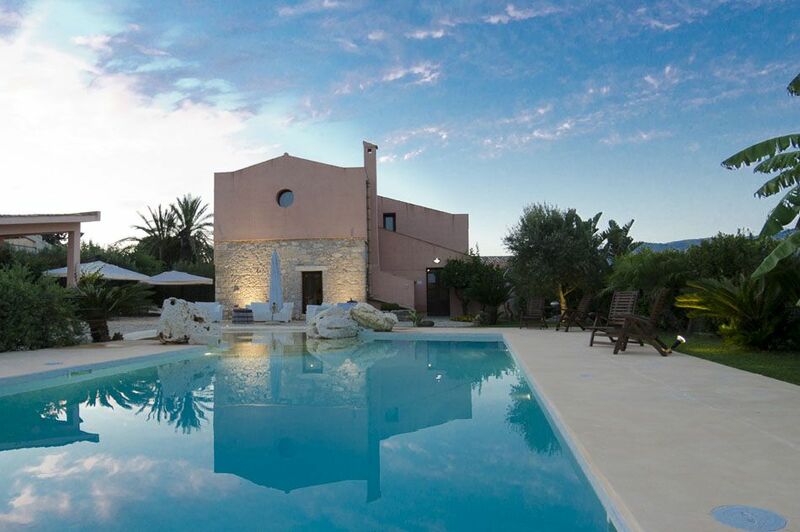 Villa Buseto nestles on the edge of the village of Buseto Palizzolo only 20 Km from Trapani. This charming Sicilian retreat stands in a peaceful location yet not isolated position with wonderful views of the surrounding countryside. The outdoor dining area and barbecue is the perfect spot to enjoy dining ‘al fresco’ perhaps using the seasonal vegetables from the villa’s garden which you are welcome to pick and use. 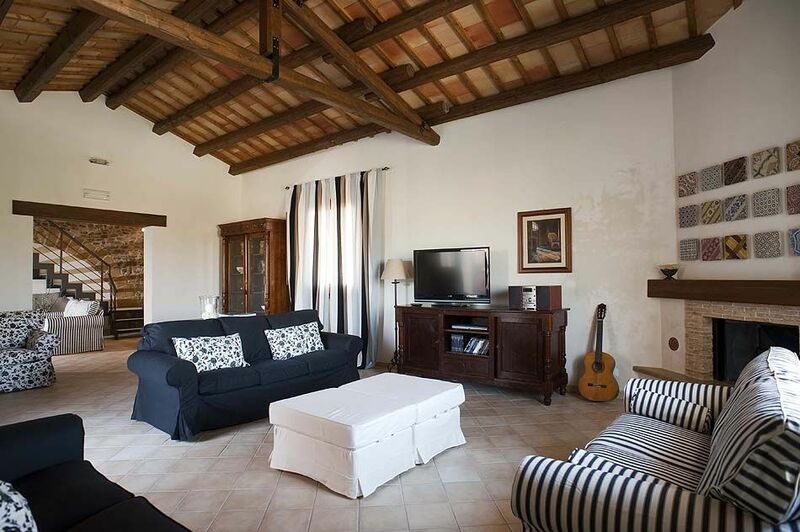 The spacious property is tastefully furnished with a thoughtful blend of antiques and contemporary pieces. The living area is comfortable and the kitchen is well equipped with all mod cons: dishwasher, microwave and even two refrigerators – ideal if you are two families travelling together! All 8 bedrooms are en-suite and have air-con. Ground Floor: living room with fireplace, sitting room, study with sofa bed and bathroom-shower, kitchen, dining room, laundry, 1 bathroom-shower, 2 double bedrooms with en-suite bathroom-shower, 1 twin bedroom with en-suite bathroom-shower, terrace, garden, swimming pool, solarium. First floor: tea-room with kitchenette, 1 double bedroom + 1 single bed with bathroom-shower, 2 double bedrooms with en-suite bathroom-shower, 2 bedrooms with a 120cm bed (French bed) with en-suite bathroom-shower. Gas cooker consumption. Water consumption. Electricity: included up to 400 Kwh per week. Final cleaning. Bed linen: twice a week change. Pool towels with weekly change. Bath towels: twice a week change. Table linen. Bedrooms and bathrooms cleaned: daily . Parking: Private. Cot. Extra bed. Welcome basket. Internet: Wi-Fi. Baby park. Beauty treatments. Guided tours. Boat rental. Car rental. Transfer. Baby sitting. Maid service. Small wine cellar. Breakfast service. Cook. Weddings and celebrations: max 50 People. Welcome buffet. Shopping list. Please note that the villa can be rented for maximum 10 people in 6 bedrooms with 5 bathrooms for a reduced rate. You can choose which bedrooms are closed off upon arrival. Trapani is the pride of Sicily’s west coast. In the last few years Trapani has been restored to its original, architectural splendour. In the majority of its tiny streets, alleys and squares traffic is not allowed and therefore its old town centre has become a real salon in the open air. Like Corso Vittorio Emanuele, the main road between the Chiesa dell’ Addolorata and Palazzo Senatorio, where there are magnificent baroque dwellings, and the Cattedrale di San Lorenzo with its crucifixion attributed to Antoine Van Dyck. Here is nice to stop in one of the many cafés and restaurants after admiring the splendid palaces Cavaretta, Riccio di Morana and Lucatelli, and walking along the sea by the beautiful promenade on the Mura di Tramontana. This Sicilian city is well connected to Europe through the Rayanair’s low cost flights, and is also a perfect starting point to discover wonderful landscapes and towns that are just few kilometres away. One example is the close Erice, which looks like a crib being up on a hill, and the road that leads to Marsala. In a striking landscape stand out the salt pans with the windmills, the sweet countryside of Trapani, and the Natural Reserve of the Isole dello Stagnone, a wide lagoon with the island of Mothia, a Phoenician colony of the 8th century BC. It is a dream-like landscape where stretch endless vineyards, that produce the rare Marsala wine, and the old “bagli” (traditional buildings with an internal courtyard) witness of the rural soul of this charming side of Sicily.